pop 12 c. (2 bags) of popcorn. 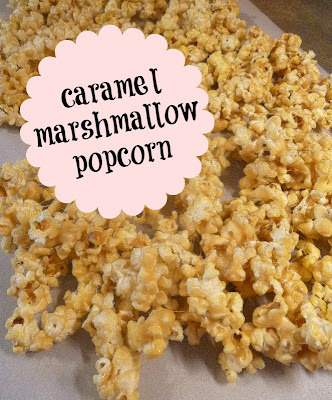 (make sure to remove the unpopped kernels) melt 1 stick of butter & 1/2 c. brown sugar in the microwave for 2 minutes. stir until you get a yummy caramel sauce. add 12 large marshmallows. nuke it for another minute or two, until you can stir the marshmallow goo into the sauce. it will take a little stirring to get it completely mixed in. FYI, this last batch i melted it together all at once and they don't seem to be setting up as well as the first three batches. they seem a bit soggy. but when it tastes this good, it doesn't stick around long enough to be a problem. what have you made lately that you "found on pinterest"? another "pinterest" project i'm doing is these braided headbands. i cut up an old tee of troy's into 1 and 2 inch strips, and have been practicing my 5 strand braid. it's getting better! these could be fun for bracelets too. i'm going to see denyse schmidt speak tomorrow night, and i am super excited! i'm taking my book to have her sign, and am looking forward to a fun night out! talk to you soon!